The Labour Law and Development Research Laboratory (LLDRL) is delighted to share two pieces of good news with the community. First, Armel Brice Adanhounme (on left), who was a Banting Postdoctoral Fellow at the LLDRL from 2011-2013, was recently hired as a professor of Industrial Relations in the Département des sciences de la gestion at l’Université du Québec à Trois-Rivières. We wish him the greatest of success in his new endeavor. 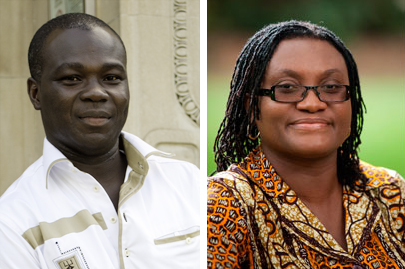 Second, we bid a warm welcome to Professor Dzodzi Tsikata (ISSER, University of Ghana, Accra - on right). A founding member of the LLDRL network, she is visiting the Faculty of Law as an O’Brien Research Fellow in Residence, to pursue a research project with Professor Adelle Blackett titled Regulatory Innovation on Decent Work for Domestic Workers.